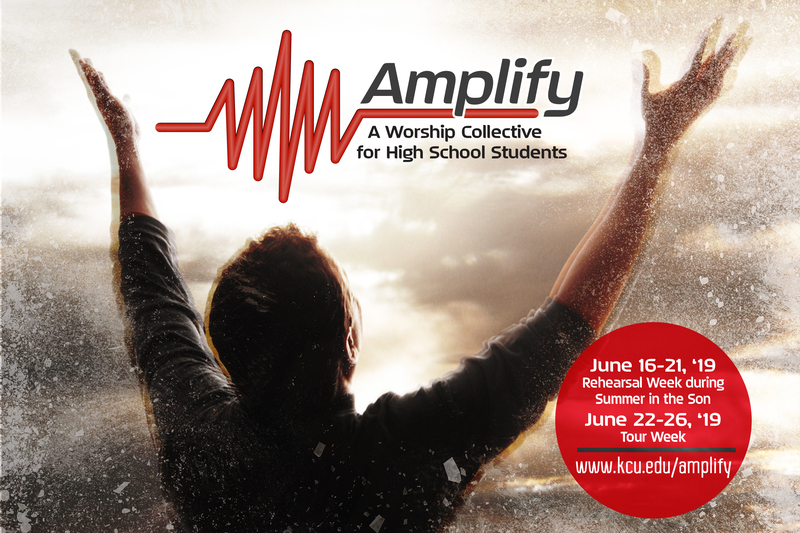 Amplify, KCU’s new high school ministry group, is an auditioned worship-leading team that will travel and minister in churches and camps throughout the region in June 2019. Do you play drums? Guitar? Keys? Do you sing? Run tech? This group is for you! Amplify will rehearse during week 1 of Summer in the Son (June 16-21), attending SITS main sessions and concerts and rehearsing during designated times throughout the day, and will tour during the following week (June 22-26). Amplify is directed by Jamie Coates, KCU worship professor and director of the KCU Worship Collective. Audition materials must be submitted by April 1, 2019. Students will be informed of audition results by April 15, 2019. Music, which will need to be learned prior to rehearsal week, will be sent to Amplify members in late April. Video requirements: Video yourself playing and/or singing two songs of worship of varying tempos (one fast, one slow). If you play more than one instrument, please video yourself playing one additional song for each instrument you play. Create and submit a video link for the audition video, preferably via YouTube or Vimeo. Payment will be due upon notification of acceptance into the group. Are You Attending SITS With Your Church Youth Group?